One look at the picture above and you’ll have to agree … Paridhi Sharma makes a gloriously beautiful bride …! With the royal couple Jodha-Akbar tying the knot in a special wedding week on Zee TV called the ‘Shaahi Saptaah’ starting 5th August, Paridhi who plays Jodha has been donning the most beautiful, rich ethnic creations and jewellery that only accentuates her natural good looks. 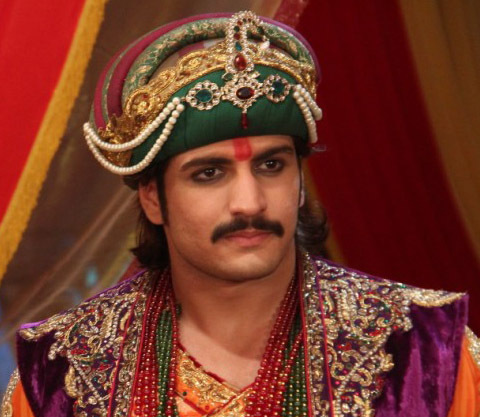 And a little birdy on the sets tells us that actor Rajat Tokas who plays Akbar is rather tongue-tied around her! Recently, for a dream sequence, Rajat and Paridhi were required to mount a horse together and sit back-to-back and charge away on it! Hardly a prude and a thorough professional, Paridhi had absolutely no qualms about shooting the sequence. But, set insiders reveal that Rajat was quite sheepish about the sequence and seemed rather embarrassed at the prospect of holding Paridhi close. It was only when the crew cracked a few jokes and made light of the situation and got Rajat-Paridhi talking that he loosened up and gave the shot! Quite a surprise package, this Rajat!